It is crucial that racer times are accurate from the start of the race to the exact time a racer crosses the finish line, this new system can capture these times very effectively. Timing is extremely accurate utilizing GPS time stamps for each timing point. Once a tag crosses a timing point a GPS time stamp is written directly to the tags memory and then transmits this time to a server. In this manner, there is NO lag time from the initial crossing of the timing point to the server. All other systems either manual processes or computer processes have some lag time involved. Using loop technology for the ready zone creates a precise accurate timestamp. The transponders are Read/Write capable- We can write timing point data to the transponder as it passes the timing loop. As the transponder travels it stores the timing point #, the GPS time stamp, and it’s unique ID (associated to racer). This allows us to either pull data off the transponder at each timing zone (via Android phone) and post to a server (local or web if available) or pull off times when the racers comes through the finish line and then push to a server. Now available for purchase and rental for complete system. Not compatible with legacy hardware system. We also can utilize our timing points to send data to production teams for video and announcers to alert the names and class of approaching racers. We will put our new system up against any timing solution on the market and believe our solution will be the most effective timing system available. Our legacy transponder system consists of hardware that is made for outdoor extreme environments. The Transponder/TAG is a dual radio system; the main radio operates a "beacon signal" to transmit the ID of the TAG, the other is a low frequency "Loop" detection frequency which allows us to define a very accurate start/finish line. Once a tag crosses this invisible line, the TAG immediately sends out an ID to the reader system which is then sent to the scoring system. The timing resolution for these tags is very good and can accurately time any off road racing scenario with an accuracy around 1/10 of a second. 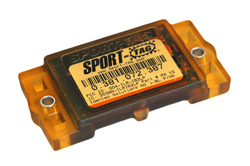 Our legacy transponders are high quality for professional racing clubs. The tags are capable of being read at high speeds and most importantly, ALL transponders require no charging. 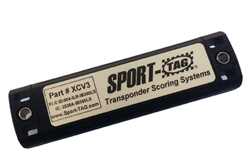 We offer two versions of legacy transponders. Our V2 is designed for bikes and quads for off road racing. Our V3 transponder tag is for mounting on trucks, buggies and UTV's.